March 17th marked the 100th birthday of the late Nathaniel Adams Coles, aka Nat “King” Cole, and guitarist-vocalist John Pizzarelli isn’t letting that important milestone go without calling attention to the influential and popular jazz and pop pianist-singer. For the occasion, Pizzarelli recorded For Centennial Reason: 100 Year Salute to Nat King Cole (Ghostlight Records) and hit the road to spread the gospel of Cole around the country. 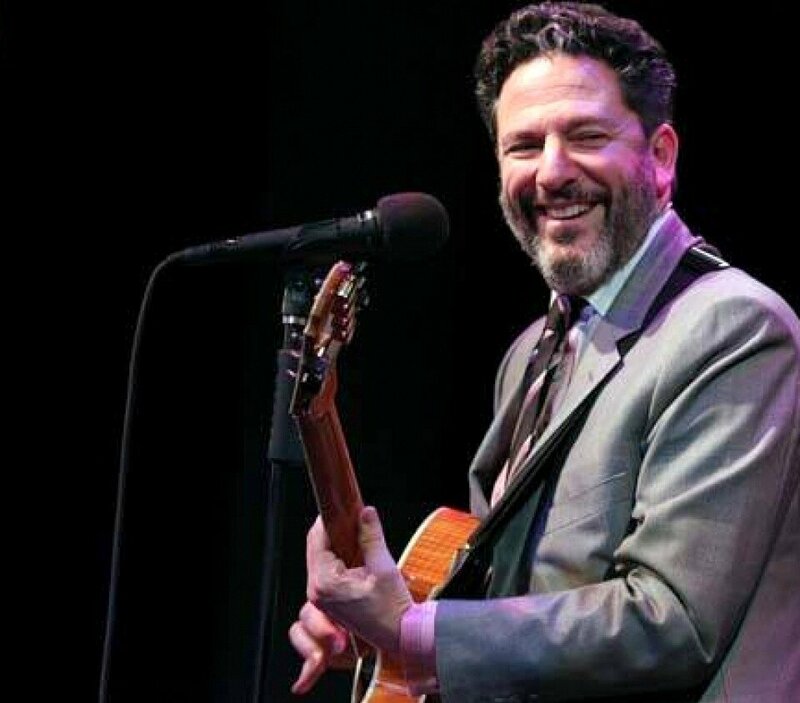 His nationwide tour includes Pizzarelli’s annual week performing at the Café Carlyle, one of New York City’s most glamorous nightclubs, and two weeks at Birdland. The Syncopated Times spoke with Pizzarelli by telephone from his “deluxe cabin” in upstate New York. He often humorously references the country getaway house on his nationally syndicated radio show “Radio Deluxe” that he hosts with his wife Jessica Molaskey, a critically acclaimed Broadway performer and singer. As a teenager, Pizzarelli didn’t listen to a lot of Nat Cole, who passed away when Pizzarelli was just five years old. Like many guitar players in the post-Beatles world, he focused more on rock music even though his father, Bucky Pizzarelli, was one of the hardest working jazz guitarists in show business. At their home in New York City, the young Pizzarelli even regularly encountered other jazz legends such as Zoot Sims, Slam Stewart, Les Paul, Joe Pass, and the “King of Swing,” Benny Goodman, who would walk around in his boxer shorts. The shift of Pizzarelli’s musical focus to Nat Cole’s music began when singer Joe Francis, a college friend, asked the guitarist to accompany him at Giulio’s, an Italian restaurant in Yonkers. “It was Joe’s sister who had a record of a guy named Frank Weber singing (Nat Cole’s) ‘Straighten Up and Fly Right’ and she said ‘you should learn that that would be a good one for you.’ So, I learned that song. I thought it was really good. I played it for my father and he said ‘Well, if you’re going to learn from Frank Weber you might as well find the Nat King Cole record of that because all his material is going to be perfect for you,’” Pizzarelli says. “These songs weren’t like ‘Night and Day’ or ‘Witchcraft’ or any of those songs. This was its own thing and for me it was perfect,” Pizzarelli says. Pizzarelli’s move into more singing also echoed Cole’s own transformation from a pianist into a vocalist after people heard his rich, smooth voice crooning “Sweet Lorraine.” (The legend that a drunken bar patron threatened Cole with violence if he didn’t start singing is just a fabricated story). The record hooked Pizzarelli and caused him to seek more of Cole’s early catalog where his jazz piano shined as bright as his singing. NYC radio disc jockey Rich Conaty and music writer Will Friedwald provided Pizzarelli with cassette dubs of the 78 rpm records Cole made in the 1940s. Pizzarelli’s timing couldn’t have been better. Swinging songs from the Great American Songbook were gaining popularity again as the young singer-pianist Harry Connick, Jr., recalled a young Sinatra on the soundtrack to the Rob Reiner movie When Harry Met Sally and rock singer Linda Ronstadt had an unexpected hit with “What’s New,” an homage to Sinatra, arranged and conducted by Sinatra’s arranger/conductor Nelson Riddle. Pizzarelli relished the chance to revisit some of Cole’s songs not only because of new approaches but also for new audiences. “There will be a whole new generation of people who listen to this record and not know I recorded those things so long ago. It was a while since I had gotten to those things so I was like, “If you’re going do it might as well just do it.” It’s part of Nat Cole’s history so I didn’t want to leave them off. The album also includes some of Cole’s lesser known songs and ones that he never recorded but fit with his sounds and style. Pizzarelli is recording and touring as a Cole-inspired drumless trio with two talented young musicians, Mike Karn on double bass and Konrad Paszkudzki on piano. Paszkudzki joins other great jazz pianists Pizzarelli has worked with on stage and on record, a list that includes Ray Kennedy, Larry Fuller, and George Shearing. The generational difference between Pizzarelli and his sidemen keeps his playing fresh. With a passion for Cole, and great jazz, it is likely that Pizzarelli will not only be influencing younger musicians but younger music fans who have the chance to see and hear him plays the great old songs. His approach makes classic tunes from the past seem fresh and new. Pizzarelli is a consummate entertainer, approachable and enjoyable, in a way that makes him fit for a King. For more information on Pizzarelli, go to www.johnpizzarelli.com.